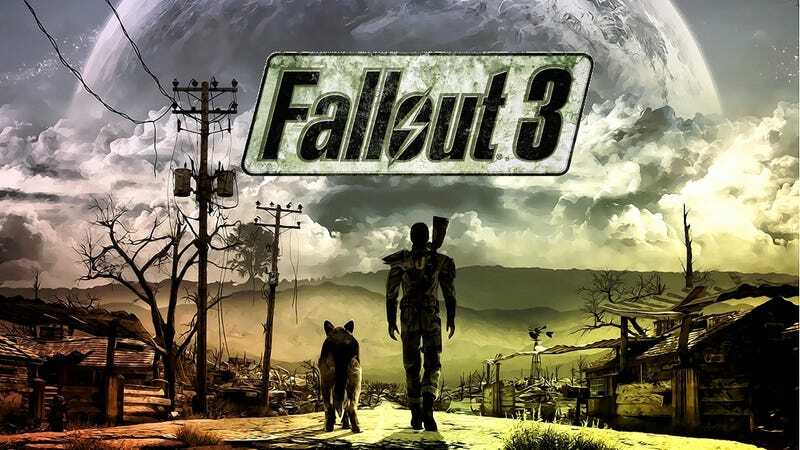 The Fallout series is one that I have always heard great things about and with Fallout 4 being just over the horizon for its November 10th release, I thought I should give Fallout 3 a try. As a disclaimer, I never played any Fallout games except for their mobile app, Fallout Shelter. Going into the third game of the series was my first experience of this post-apocalyptic world. However, the original Fallout and its sequel actually seem to be more up my alley with their isometric play-style. That being said this was one of the best first person open-world games I have ever played. While I am about 7 years late to the party, I will mention that there are SPOILERS for anyone who hasn’t played the game. The first thing I noticed about Fallout 3 was how great the soundtrack is. I love the 1940’s - 50’s motif that is found throughout the game and that especially shines through on the Galaxy News Radio station. I love the juxtaposition between this bleak post-apocalyptic world and the happy melodies such as Jack Shaindlin’s “Let’s Go Sunning” and Allan Gray’s “Swing Doors”. I’ve been listening to the entire soundtrack while I work, play, or just putz around the house. I’ve been listening to Cole Porter’s “Anything Goes” a lot and I highly recommend you do the same while reading this. While I was a bit confused in the beginning of the game, I quickly figured out what I needed to do. The game gives you some background about the world as well as who you are and how you fit into the story. You are born and have a little bit of time as a toddler before being transported to your 10th birthday. During the party you can interact with a few characters, get to know your bully (Butch), your friend (Amata), and receive your Pip-Boy 3000. You also learn how to shoot with your Dad down in the reactor level, squashing your first radroaches. After completing the basic quests, you fast forward to your 16th birthday. All the kids in the Vault are required to take the G.O.A.T or Generalized Occupational Aptitude Test. During your time in the vault you are giving your character a base of Karma, that will ultimately decide if you are good or evil. I took the good path, but I may go back and try the evil path someday. From what I understand it’s not so easy to change your karma once you’ve established what kind of character you’re going to be. The final scene inside the vault you are warned by your best friend Amata, that your father’s lab assistant was killed, while your father does escape the vault and the authorities, they are now after you. She tells you there is a secret tunnel in her father’s office and helps you evade capture. I made it through the big Vault door and I found myself looking up at the sky and the desolate wasteland before me. As I traversed the landscape a bit, I became more acquainted with the V.A.T.S. system. The first time a mole rat ran up to attack me, I was able to pause time and aim right at his head. Though at such an early stage of the game and equipped with only one pistol, I was unable to kill him using only the V.A.T.S. and had to rely on some first person shooting skill (which I have very little). After wandering a bit more, I made it to Megaton - a city built around a dormant Nuclear bomb. Keeping with the good Karma, I decided to take on the mission of permanently disabling the bomb. However, I was unable to do so early on, so I saved that as a quest for later. I began poking my head around the city, meeting whoever else I could and gaining quests to take on. While I was questing, I was presented with the alternative to detonate the bomb. Mr. Burke was sitting in Moriarty’s bar and gave me information from his benefactor who wanted the bomb detonated. I had already decided I would disarm the bomb, so I reported Mr. Burke to the local Sheriff, Lucas Simms. Simms did not take kindly to the information and decided that we should confront Mr. Burke. When we did, Mr. Burke lied about his intentions so I decided to have some vigilante justice and shoot him. In the heat of the moment, I failed to see that Mr. Burke actually killed Lucas Simms. Apparently I took the blame for Simms death and the settlers of Megaton all began shooting me, eventually running me out of town. I honestly had no idea what was happening at that point and ended up finding out from a friend that I would need to wait 72 hours before I could return to the city. The open-world first person style of games have never been much my type of gameplay, but Fallout 3 was able to quickly drag me into a black hole of gaming bliss. I was enthralled by the missions and the post-apocalyptic world before me. I found the main storyline to be engaging, but I was equally impressed with the side quests. I wasn’t really bored by the side quests, even if they were inane tasks such as “Collect 20 Chinese Assault Rifles to trade”. I was able to complete certain side quests like that one, while working towards the main storyline. While I did love the game, the main storyline was also a little short. I came upon the end of the game rather quickly. Sure, I may have spent a whole 14 hour day playing the game, but I know there was much more to explore that I hadn’t been directed to. I actually had to go back to a previous save and ignore the final quest just so that I could find some of the locations I didn’t stumble upon already. After returning to my previous save, I had already got the G.E.C.K. and lost it to the Enclave but also made a friend/follower out of a Super Mutant by the name of Fawkes. I had also acquired another follower in canine form, named Dog Meat. However, he seemed to have disappeared after Fawkes started following me. Maybe he just didn’t like the Super Mutant in my presence? So with my one follower, I just decided to ignore the last mainstory quest for a bit longer. As I wandered the wasteland, more and more locations appeared on my Pip-Boy’s map. I started discovering that there was much more content then I had originally thought. Now I have set about trying to get the side quests done before completing the final quest of the main storyline. My own quest right now is to obliterate the slavers from the map. So far I have ruined their Evergreen Hills base, infiltrated Paradise Falls, cleared them out of the Lincoln Memorial, freed all the children slaves, and killed the slaver they sent to Little Lamplight to capture really young children. Now that I am getting most of the side quests done, I am considering getting the DLCs that Bethesda released. I am especially drawn to the Brotherhood of Steel DLC Broken Steel that appears to let you continue the game where you left off with the water purifier. I’m not too sure about The PITT or the Mothership Zeta DLCs however. Has anyone played these? Are they worth the time? Let me know what’s your favorite DLC in the comments or anything else I should be on the lookout for in the game. Thanks for reading!